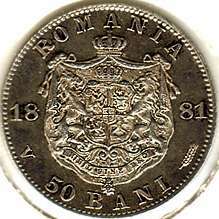 denomination "50 BANI", year 1881, ROMANIA, Romanian coat of arms, letter V standing for Vienna mint and wheat ear, the sign of Romanian mint, outer pearl circle inscription "CAROL I DOMNUL ROMANIEI" meaning "PRINCE OF ROMANIA" and CAROL I head facing left, outer pearl circle. Under the neck lies KULLRICH, the engraver's name. 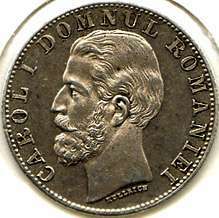 In Moldavia the 50 bani coin was also called dutcă (dutce at the plural) or dupcă, recalling of some small Russian and Polish silver coins that also circulated in the Romanian Principalities. In Walachia it was also called băncuţă.